The setting may not be what the architects had in mind, but could it be any better! 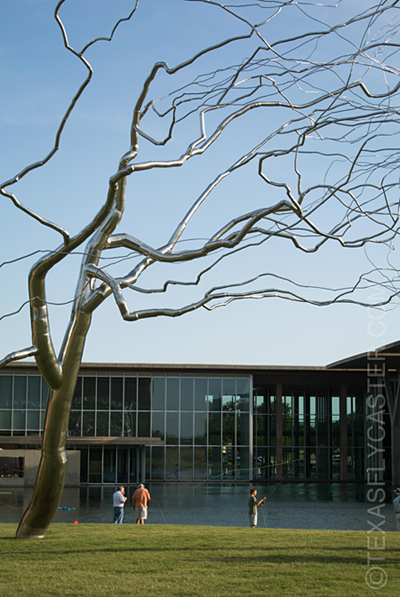 Casting outside the Fort Worth Modern Sunday afternoon. Last night’s Fly Fishing Film Tour (F3T) stop in Fort Worth didn’t do much to give me that adrenalin hit that would keep me awake for hours after it was done and I was home. In fact, it almost put me to sleep a couple of times – in the beautiful surroundings of the Fort Worth Modern’s theater. I am never sure what my expectations should be for one of these annual F3T shows. Is it a movie, a series of trailers, a bunch of shorts, or what it looked like to me last night – a bunch of guys who had cameras along for their exploits in what I call – POINT AND SHOOT LAND. What, you should ask, is “POINT AND SHOOT LAND?” That’s a place anyone can go, usually after some exotic transportation methods, after some perceived tribulations, and arrive, pull out a camera and start shooting. Everyone ohhhhs and awwwwws at the sights captured – not even realizing they can do the same thing if they just get to POINT AND SHOOT LAND. What was most lacking in many of the shorts last night was a classic storyline – a beginning, a middle and an end … a build, climax and resolution. You know, all the things that make a story work. Although I didn’t get that adrenalin rush, my head was swimming with ideas on how to make something (a movie) that has all the elements AND a good topic, or story. It didn’t hurt/help to have a few friends throw in “you should make one!! !” in our post movie conversations outside the theater. Anybody interested in making a fly fishing movie. It’ll take a year, it’ll cost thousands of dollars, your dog will forget who you are, and in the end you won’t make a dime? And you might have to slap on some gratuitous gear, like snazzy shirts that don’t even fit, just to put gas in the tank. 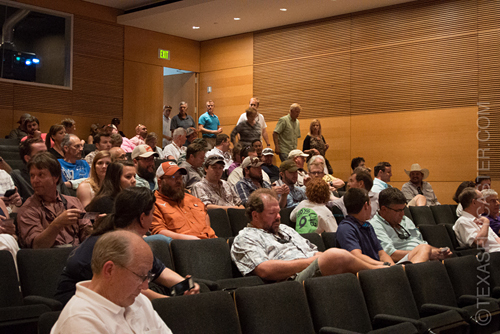 Crowds file in to the Fly Fishing Film Tour showing for 2014. Our fly fishing movie is simply called, “Texas.” Why? Because the first words out of most foreigner’s (those who live outside Texas) mouth’s when you tell them you fly fish in Texas is, “Texas?” What’s the story? It’s about all the different fly fishing opportunities there are in Texas! There will be two main characters driving the action. Two guys take on all Texas has to offer in the way of fly fishing in Texas. And it ends with them running off the road in the middle of the night, in the middle of nowhere, a car wreck, car upside with the wheels still spinning and Lynyrd Skynyrd’s “Free Bird” (the live version) playing on the radio. We don’t know if the characters live or die. What do you think? A good friend of mine actually has a fantastic movie script that is driven by fly fishing, much like in “A River Runs Through It,” it has a great story with classic construction. I am still trying to talk him into releasing the script, selling it actually, as an E-Book. Maybe we can generate some pres-sale interest? I haven’t really perused the kick starter website, although I certainly have thought about funding these ventures that way. I know you guys would kick in! For you YOUTUBERS out there, have a look at the right column of Texas Fly Caster for videos on the Texas Fly Caster Youtube Channel. AND, now keep an eye there for video uploaded to that channel – immediately from locations! I tried the technology last night, and the only problem is you really need a WiFi connection, and not simply uploading via the phone’s data connection. Where am I going to get a WiFi connection out in the middle of nowhere Texas? I shot a video of JD trying her hand at the casting contest last night, tried to upload like normal, gave up, later went inside and connected to the Museum WiFi and uploaded it in about 20 seconds. STAY TUNED as the work is piling up for release here – an adventure in chasing striper on Lake Texoma on fly, video from the Tailwaters Birthday party, the dog fly … and all the things fit to print – all the print that fits. Pile all the new action this week on top, and what do we have? A cake! A big fat sugary cake sure to get your pressure up, and your brain driving. Whoops! There’s still another week until the Bass on Fly World Championships!